Long after HAL and February The Fifth, the Gregorian Royal Family gene pool has degenerated so badly that the next Supreme Potentate of Gloth is destined to be be a boy idiot, whose father died racing him to the Palace garden. His father won the race by jumping from the Palace roof screaming, ‘I win! I win!’ just before meeting his death on a brick pathway alongside a beautiful bed of roses. The death however, finally provides Septimity and his six brothers the chance to enact Ichor. Planned for eons, their dream is to return a pure blood Glothian to the position of Supreme Potentate and rid Gloth of all the embarrassing Erdean monkey genes that had infected their planet for almost ever. However as is the way with plans, not everything goes as it was envisaged and as Septimity discovers, the very best way to handle major plan problems is to leave them all until tomorrow and get on with enjoying breakfast. 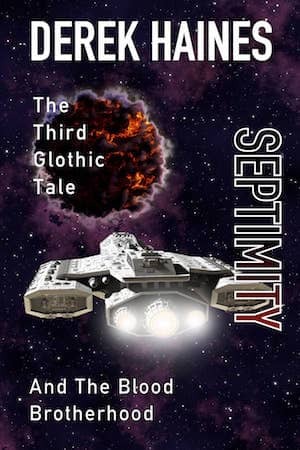 Join Septimity and the Blood Brotherhood in this third and final Glothic Tale and have a fun filled giggle around the galaxy. After reading Hal and February the Fifth, Derek Haines has finally honored his readers with the last of his trilogy, Septimity! Septimity is September’s grandson. September is the eldest son of December the Ninth, and a grumpy old man. September thought he was going to be the new Supreme Potentate of Gloth. However, due to running into a brick wall, literally, this did not happen. His unexpected death gives Septimity and his six brothers a shot at the title. This family is absolutely hysterical! Not only will it remind you of your own family, morons and imbeciles included, but the situations they encounter trying to obtain the Supreme Potentate of Gloth will in no doubt have you relating your own family situations to this science fiction story. Kids are kids even on the planet Gloth! Derek Haines entertains his readers with his two most amazing traits. First is his sense of humor, and second is his strength of building his characters even if they look like lizards! After reading Derek Haines books I think I have come to realize he expresses his own personal views on life through his apropos vocabulary in his characters and excellent writing skills. Reading between the lines and having a good laugh is a treat. Here at long last is Derek Haines’ final Gloth sci-fi tale. Sometimes the best laid plans for revenge just don’t come off as September and his six clones led by Septimity find out. “Septimity – The Blood Brotherhood” is another brilliant laugh penned by Derek. Well worth you taking the time to read it.